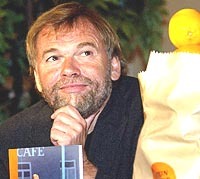 A truly inspiration writer, Jostein Gaarder. One of my most favorite. I simply fell in love when I started reading about "Sophie's World", his hugely popular novel about the history of philosophy. It was so addictive. Porbably the single most beautiful novel I have ever read in English Literature on such a heavy subject as philosophy. The way Jostein uses his writing talent to describe many fundamental questions about our existence and life has no comparison. After Sophie's World, it was The Solitaire Mystery. I really enjoyed this one as well.